Curly in the City: I am BARE.... are YOU?! I am BARE.... are YOU?! I am in full support of 'TOMS Shoes'. What they do, what they stand for, and how amazing they are! Do you have any TOMS'??? Sadly I don't own any (well technically I do! they are mine whenever the postal service decides to deliver them). Any who. Today I will proudly be supporting their cause 'One Day Without Shoes'. Not sure exactly what the office big-wigs at Corporate America (ie the j-o-b) will think....but you can be sure that I will be dangling bare feet under my desk and all the minutes spent outside of the office. Are YOU?!?! HUH??? 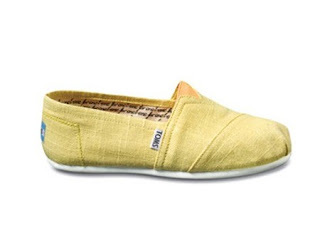 TOMS warms me in a real cuddly, soul satisfying and totally yummy kinda way. I don't know how to explain it. The mission of their company, to me, is amazing and one that should be adopted by so many more! They donate a pair of shoes to children in need. One for one. For every pair you or I purchase they deliver one pair to a child in Argentina. They are committed to deliver 100,00 to the people of Haiti in support of Clinton's Global Initiative. I can't wait to start rocking mine!!! You know I will be rocking them hard this summer...look out white jeans and shorts! HA! Do you guys have any? What is your favorite color? Style? Oh and TOMS (if you are out there!) please pick me to go on a SHOE DROP!!! Oh please oh please! It would be the most amazing trip of my life, I have got to figure out a way to go do this with them, even if they don't pick me, I have got to get on one of their trips....devise scheme begin!